On Sale Now! 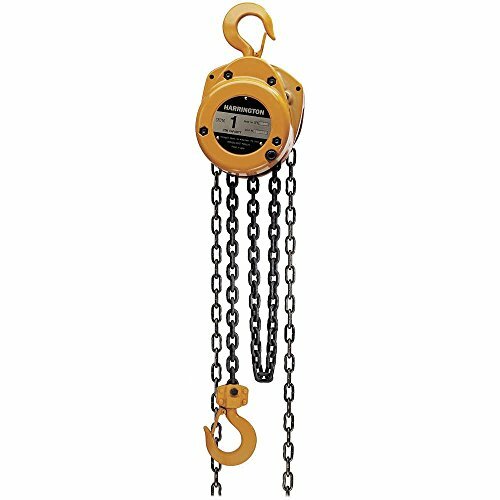 Save 10% on the Harrington CF Series Die-Cast Aluminum Body Hand Chain Hoist, 3 Ton Capacity, 15' Lift Height, 13.5' Hand Chain Drop, 23.2'' Headroom by Harrington at N Online Agency. MPN: CF030-15. Hurry! Limited time offer. Offer valid only while supplies last. Harrington CF hand chain hoists give you a practical alternative thanks to an economical design using fewer parts for trouble-free service. Harrington CF hand chain hoists give you a practical alternative thanks to an economical design using fewer parts for trouble-free service. Outstanding durability is due to a die-cast aluminum body and high-strength, heat-treated main pinion shaft and load gear. Pre-lubricated ball bearings, precision machined gears, and Weston-style load brake make lifting smooth and easy while allowing long service and low maintenance. Experience exceptional strength with a thick die-cast aluminum body. Handle tough demands with high-strength, heat-treated main pinion shaft and load gear. Get positive braking action with Weston-style load brake incorporating two moisture-resistant brake pads with four braking surfaces. Minimize manual effort thanks to smooth running, pre-lubricated ball bearings, and precision machined drive train components. Simplify maintenance with fewer parts and an easy-to-work-on design. 15-foot lift is standard, nonstandard lifts and hand chain drops available as well. Grade 100 heat-treated manganese alloy load chain resists abrasion and wear while minimizing chain weight. Forged and heat-treated alloy steel hooks are designed to open slowly and not fracture under excessive loads. Test certificate verifies that every hoist has been factory load tested to 125 percent of rated capacity, in accordance with AS ME B30.16 requirements. If you have any questions about this product by Harrington, contact us by completing and submitting the form below. If you are looking for a specif part number, please include it with your message.